How to find out these pests look like and more! Can Pests Kill Your Orchids? Can These Pests Kill Your Orchids? 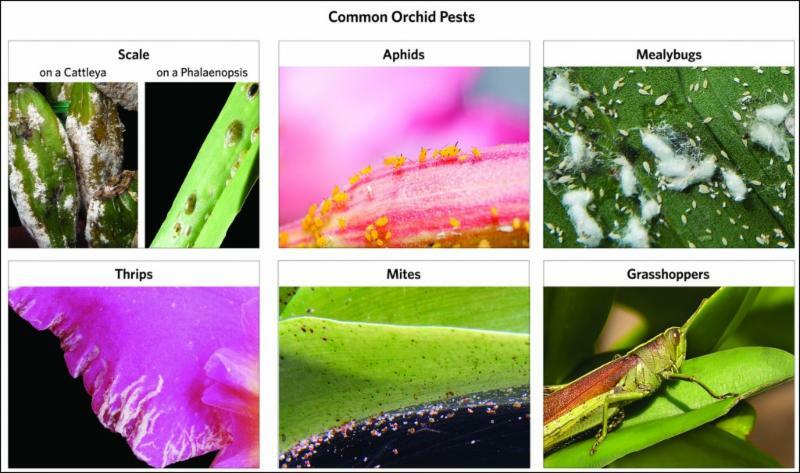 There are more pests that are out to get your orchid, but these are only common Orchid pests that we are here to teach you about. 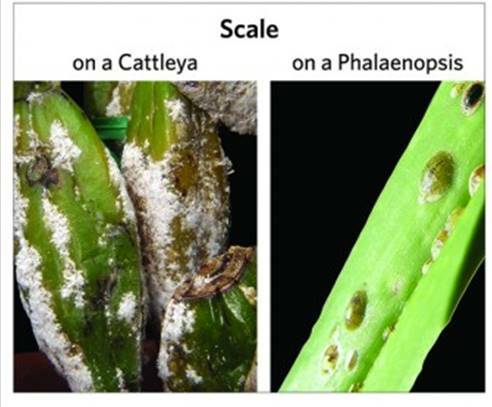 Below you will find a short synopsis of what pests can do to your orchids. 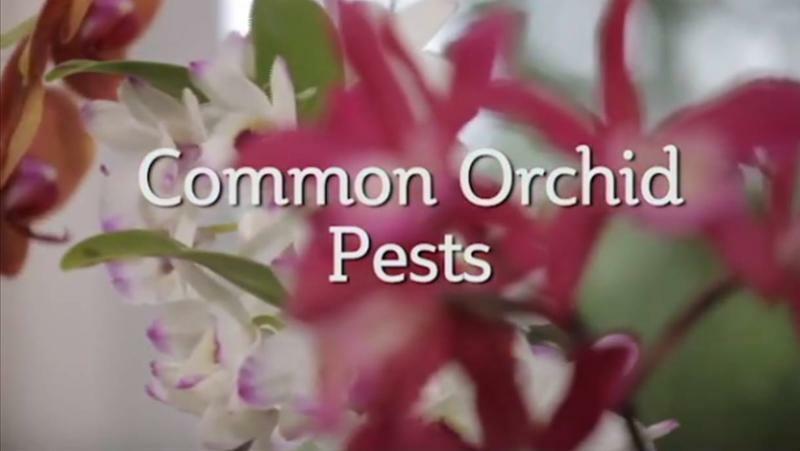 Please click on the links below to find out more information to find out what these pests can do to your orchids and how you can eliminate them. Scale are piercing, sucking insects that are difficult to control as the reproducing females are covered by a protective shell which also protects her eggs. To remove scale, use a small toothbrush or cotton swab soaked in rubbing alcohol (known as isopropyl alcohol) to remove the pests. Do not use other forms of alcohol. 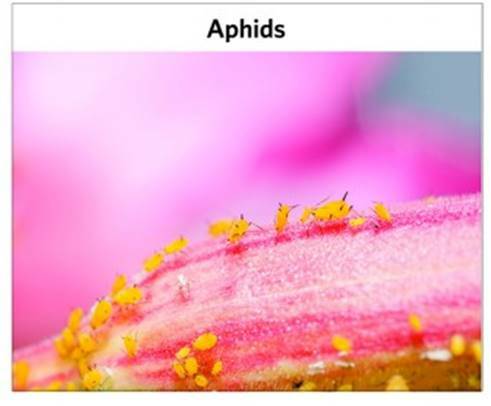 Aphids are small, soft-bodied insects that are generally pear-shaped and green or black in color. They reproduce rapidly and are most often seen on flower buds/spikes and new growth. They produce honeydew which can encourage the growth of a black fungus known as sooty mold which is often a telltale sign of aphid infestation. To remove aphids, use a small toothbrush or cotton swab soaked in rubbing alcohol (known as isopropyl alcohol) to remove the pests. Do not use other forms of alcohol. 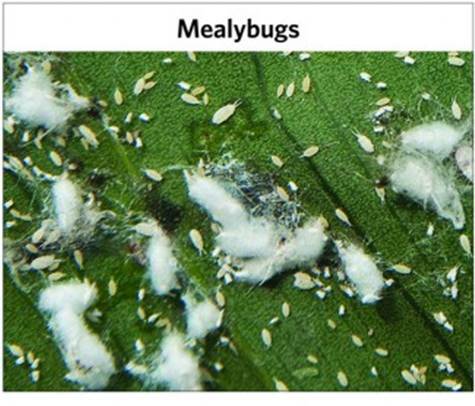 Sometimes confused with scale, mealybugs are a soft-bodied insect that are readily identified at the mature stage as white to greyish-white and cotton-like. They are often found in the same areas as scale and can do substantial damage if not dealt with immediately. To remove mealybugs, use a small toothbrush or cotton swab soaked in rubbing alcohol (known as isopropyl alcohol) to remove the pests. Do not use other forms of alcohol. To get rid of thrips, purchase a pesticide. However, the plant should be inspected again every week and the procedure repeated until no infestation is visible. Two repeat applications at weekly intervals are necessary to control successive generations. 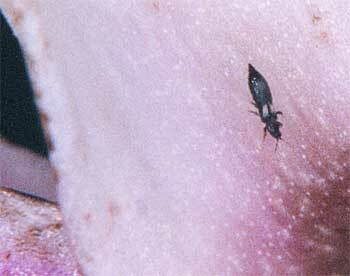 Mites are microscopic, and their presence is often not known until the damage is very evident. They often attack the undersides of leaves leaving areas that look slivery and pitted. 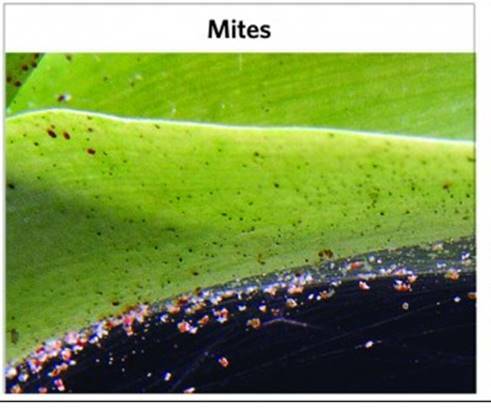 To get rid of mites, it is important to note that mites are not insects! So, most insecticides are not effective against mites. You must purchase a pesticide that is specifically labeled as a miticide for use against this pest. For small infestations in the home, wiping the infested areas with a cotton ball dipped in rubbing alcohol can be effective. 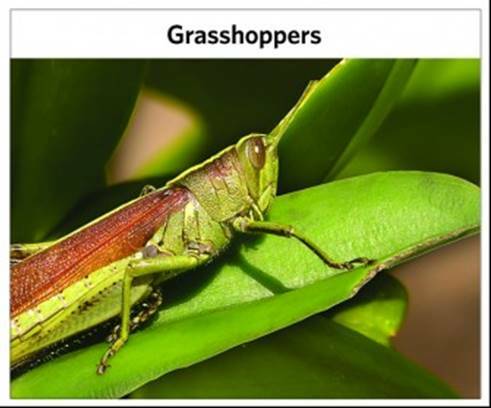 Grasshoppers, especially Lubbers, can do significant damage to your orchid in a very short period of time. Lubbers are usually 1” to 3” long and can vary in color from yellow to black depending on the Lubber species and stage of growth. These are best controlled immediately by hand, pruners or shoe/boot. To find out more about your Common Orchid Pests please click on the above links or you can click here. We hope you found this informational and check back next week when we discover why many orchids may contract certain diseases. Pest problems do occasionally occur with orchids. Correctly identifying the source of the problem is key to understanding how to treat your orchids and eliminate the pest. 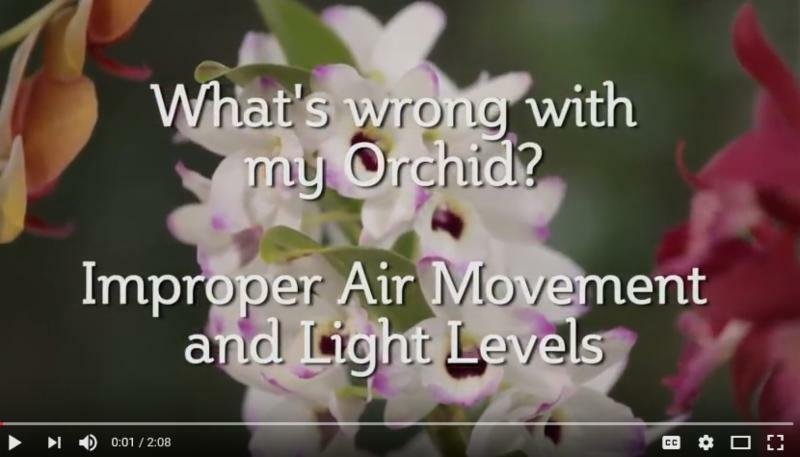 In this video, we’ll show you examples of insect problems with orchids and discuss how to remedy the most common problems.